César Gaviria is known in Latin America as a conflict mediator, advocate of democracy, staunch supporter of regional integration and defender of human rights. He served as President of Colombia from 1990 to 1994, and was then elected Secretary General of the Organization of American States (OAS) in 1994. He was re-elected for a second term from 1999 to 2004. Through his strategy for a “New Vision of the OAS,” César Gaviria fostered profound institutional changes that reinvigorated the inter-American agenda and prepared the Organization to meet the challenges the region faces today. During Gaviria’s tenure, the OAS intensified efforts to improve hemispheric security and combat terrorism, drugs and corruption. It became a key player in the Summit of the Americas process, and now serves as its technical secretariat and institutional memory. The Organization has also advanced the concept of integral solidarity and has reformed its technical cooperation programs. César Gaviria began his career at age 23, immediately after obtaining his degree in Economics from Universidad de los Andes in Bogotá, when he was elected councilman in his hometown of Pereira. In 1974 he was elected to Colombia’s House of Representatives, which he became the president in 1983. 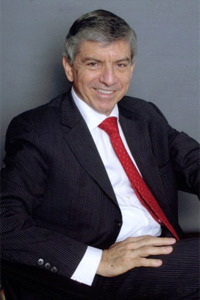 In 1986 Gaviria became co-chair of the Colombian Liberal Party, a position he held during the successful presidential campaign of the party’s candidate, Virgilio Barco. Mr. Gaviria served in the Barco administration first as Minister of Finance and later as Minister of the Interior. In early 1989, he left the government to manage the presidential campaign of Senator Luis Carlos Galán. Following the brutal murder of Senator Galán by drug traffickers, the Liberal Party chose César Gaviria as its candidate. He was elected President of Colombia in May 1990. During his four-year term (1990-94) he enacted policies to strengthen democracy, promote peace, and reintegrate armed rebels into civilian life. In 1991, through a plebiscite and elected constitutional assembly, Colombia drafted a new, more democratic constitution.